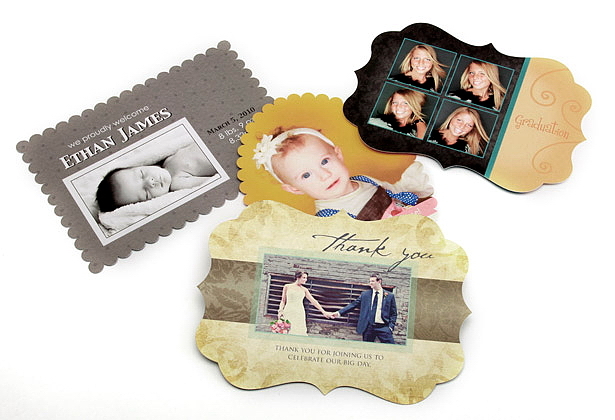 Popular uses of our Cards include: baby announcements, high school senior graduation announcements, wedding invitations, thank you cards, stationery, and of course holiday greeting cards. Cards are available in 4x5.5, 5x5 and 5x7 sizes, both flat and folded styles. 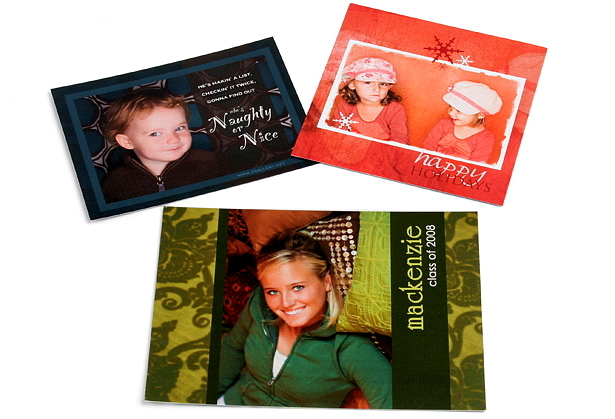 An additional 3x3 size is available as a flat card only and does not include envelopes. 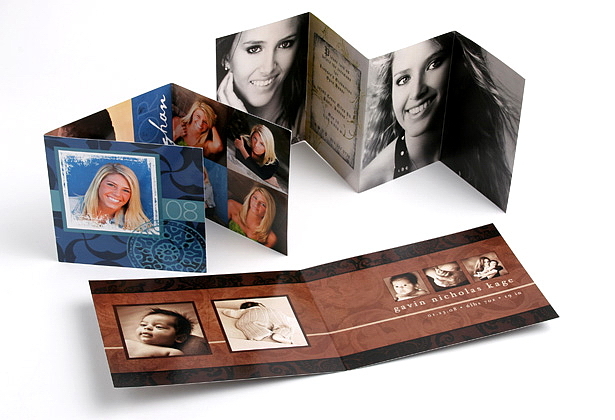 Non-traditional sizes and styles include a 5x7 Wide Format, 5x5 Trifold, and a 4x5.5 Accordion. All sides of the cards are fully customizable with full color. Our Cards are affordable priced with quantities as low as 25 and include envelopes. Our printed Cards come in packs of 25 and include envelopes. 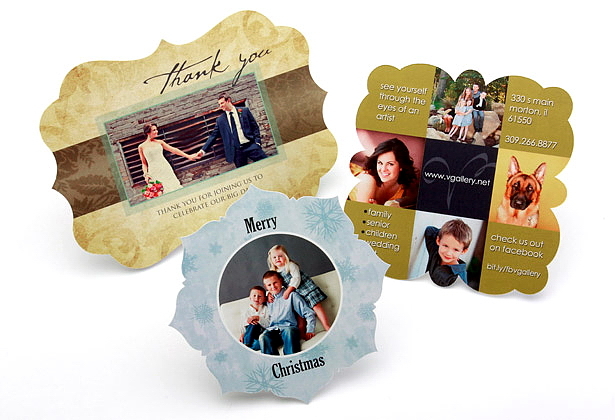 Flat printed cards come in 4x5.5, 5x7 and 5x5 sizes. 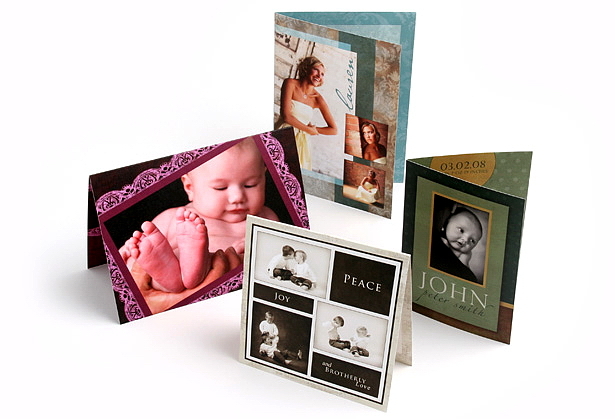 Folded cards come in 4x5.5, 5x7 and 5x5 sizes. 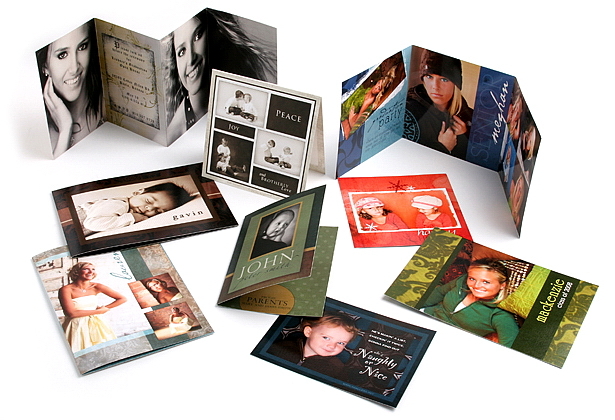 Non-traditional cards include 5x5 trifold, 4x5.5 accordion fold and 5x7 wide format. Paper types for Cards. New Art Recycled paper not shown. Let our studio take your printed cards to a new level of distinction with 50 shapes of Boutique Cards. Choose from basic shapes, curved shapes, scalloped edges, geometric and ornate designs for 5x7 and 5x5 flat press printed cards. Boutique Cards are available in quantities as low as 25, and include envelopes. 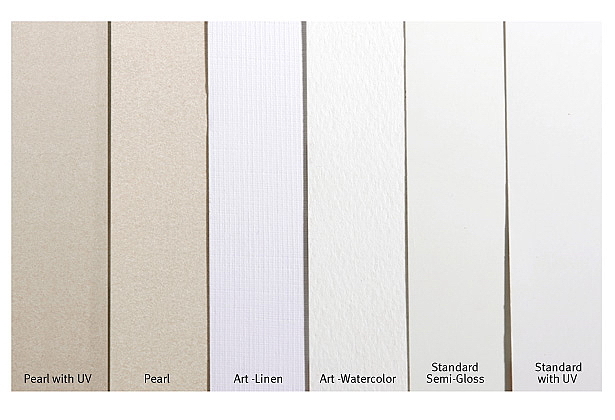 Six paper options are available including Standard, Art Watercolor, Art Linen, Art Recycled, Premium Matte, or Pearl as well as a UV coating option for Standard, Premium, and Pearl papers. Both sides of the cards are fully customizable. 50 shapes available in basic, curved, scalloped, geometric, and ornate designs. 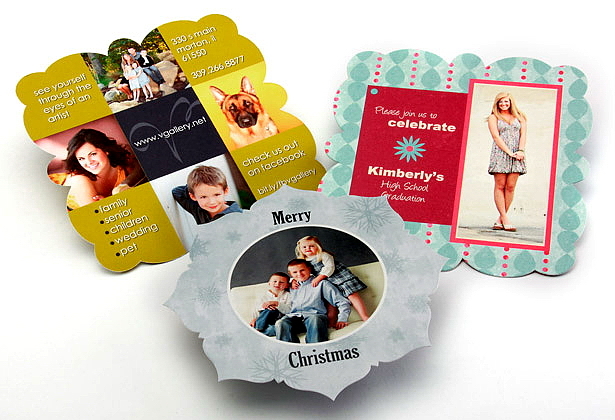 Several shapes are offered in 5x7 sizes. Several shapes are offered in 5x5 sizes. Paper types for Boutique Cards. New Art Recycled paper not shown.